If you don't have a landline or a nearby friend with a cell phone, finding a misplaced phone can be a struggle. With this smart device, calling a lost phone is as easy as knocking your fist on the kitchen table. That's not the only thing Knocki can do. As The Verge reports, the gadget can be used to transform any flat surface into a remote control for smart devices within your home. It uses an accelerometer to detect rhythmic knocks, so users can mount the device on their bedside table and program it to activate the snooze button when they tap anywhere on the nightstand. Knocks can also be used to switch off lights, trigger a security alarm, or start a pot of coffee in the other room. Knocki works with the recipe programming service IFTTT (which, if you don't already make use of, will change your life) to control Wi-Fi enabled devices like LIFX light bulbs, Nest thermostats, and more. 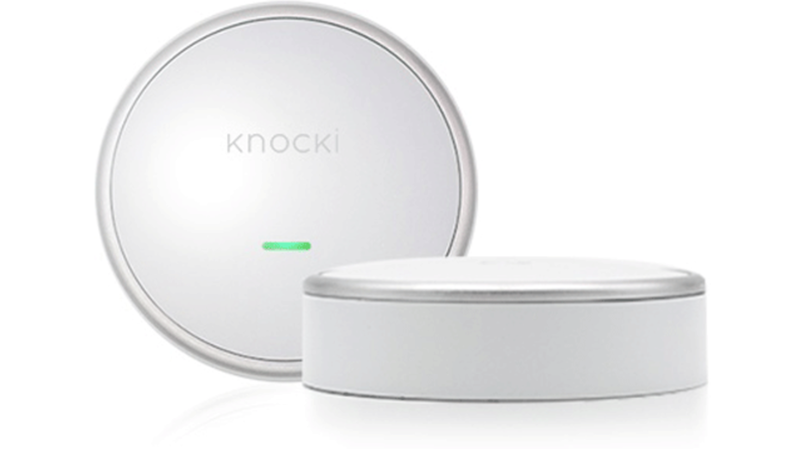 Knocki launched its crowdfunding campaign earlier this week and has already surpassed its initial $35,000 goal by nearly $200,000. To reserve a Knocki of your own, early birds can pledge a donation of $69 or more with delivery expected for this December.